TORONTO - Toronto-Dominion Bank and Canadian Imperial Bank of Commerce both reported earnings ahead of expectations on Thursday, continuing a strong performance by leading Canadian lenders in the last quarter. TD, Canada's second-biggest bank, reported an increase in third-quarter profit, helped by growth in its U.S. retail and wholesale banking business. CIBC, the country's fifth-biggest lender, also beat forecasts bolstered by improved results in its retail and capital markets divisions. Royal Bank of Canada and Bank of Montreal reported earnings that beat forecasts earlier in the week. “What it shows is [the banks are] great capital allocators; number two, the business is pretty much recession-proof, which is fantastic; and, three, it just shows that maybe the consumer itself is not as unhealthy as we might think – or at least they’re willing to continue to keep spending in spite of what appears to be a slowing economy," John Stephenson, president and chief executive of Stephenson & Company, said in an interview with BNN. Barclays analyst John Aiken said he believes TD’s earnings will receive a “warm reception” from the market today. "TD came in ahead of expectations making it four out of four in terms of beats so far in the quarter," Barclays analyst John Aiken said, referring to results posted by the quartet of major Canadian banks this week. TD said earnings, excluding one-off items, rose to $2.42 billion, or $1.27 per share, in the third quarter ending July 31 from $2.29 billion, or $1.20 per share, a year earlier. Analysts on average had expected earnings of $1.21, according to Thomson Reuters I/B/E/S. Funds set aside by the bank to cover bad loans fell to $556 million, or 0.38 per cent of total loans, compared with $584 million, or 0.42 per cent, in the second quarter. Like other Canadian and U.S. banks, TD had seen an increase in loans to clients in the energy sector turning bad due to the slump in oil prices which hit a 13-year low earlier this year. 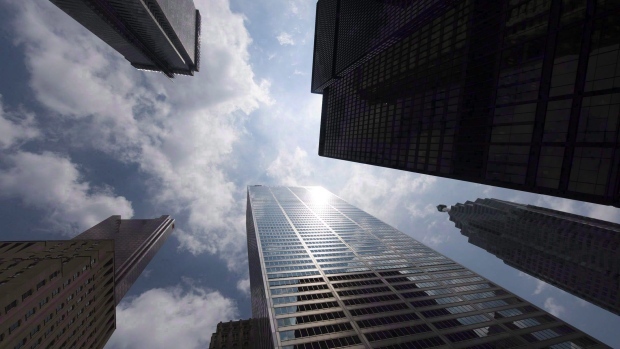 However, industry analysts say a crude price rebound in the Canadian banks' latest quarter helped some of these debtors pay back loans. Net income at TD's U.S. retail bank rose to $788 million from $650 million a year ago. Its wholesale banking unit's net income was $302 million, up 26 per cent from the third quarter last year. At the bank's Canadian retail business, net income fell by 3 per cent to $1.51 billion, weighed by a 15 per cent increase in insurance claims and related expenses to $692 million following the wildfires in Fort McMurray, Alberta, where TD has a significant market share. CIBC reported a 9 per cent increase in earnings per share, excluding one-off items, to $2.67 per share. Analysts on average had expected earnings per share of $2.35 per share, according to Thomson Reuters I/B/E/S.